Mama, Mammy, Mom, Mommy. Sweet, Beloved, Dear. Think of all the terms of endearment we use for our mothers. Think of all the terms of love and care our mothers use for us. Of all our titles and names for Mary – The Litany Of Loreto, also called the Litany Of The Blessed Virgin Mary, repeats about fifty titles for her – Holy Scripture uses none of them. Imagine Jesus, Son of Mary, son of a mother who is (as far as sin goes) perfect, so she loves with a love as humanly perfect as possible, and how he referred to her every day. We can imagine, but we don’t know. In all of Holy Scripture, God did not inspire any gospel or epistle writer to let us in on how Jesus, day to day, referred to His mother. We do, however, know on several occasions He spoke to her as “Woman.” Although we cannot know God’s plan in having Holy Scripture written, and His ways are not our ways, it must be true that there is something very important, very significant about Jesus’s use of the word “Woman” when referring to his Mom. 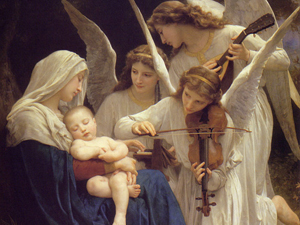 Similarly, it must be the case that Mary had some special name or names she used for her Son: Darling Baby, Love, Sweet Child of Mine. The Bible is also silent about Mary’s word of love for her child. When Mary does address Jesus, either she uses no name or she calls him only “Son.” The gospel writers wanted it to be very clear that Jesus, the Messiah, the Son Of God, was also Son of this woman, Son of Mary, Mary our fellow human being, the Mother of God. Jesus was not being rude, mean, or disrespectful when He called Mary “woman.” Most probably, both times related in Holy Scripture in which He referred to her as “woman,” were not private conversations. Both times were public. Jesus knew others would hear what He said and he knew it would be recorded, repeated, and read for all time. The other very public time Jesus refers to Mary as “woman” was when He was dying on the cross. Now there were standing by the Cross of Jesus His Mother, and His Mother’s sister, Mary of Cleophas, and Mary Magdalene. When Jesus, therefore, saw His Mother and the disciple standing by, whom He loved, He said to His Mother, ‘Woman, behold Thy son.’ Then He said to the disciple, ‘Behold thy Mother.’ And from that hour the disciple took her into his home (Jn 19: 25-7). So the Lord God said to the serpent, “Because you have done this, cursed are you above all livestock and all wild animals! You will crawl on your belly and you will eat dust all the days of your life. And I will put enmity between you and the woman, and between your offspring and hers; he will crush your head, and you will strike his heel” (Genesis 3: 14, 15). Enmity is a state of being opposed to a hostile enemy. Jesus knew Genesis 3:15 and He knew its relation to what He was accomplishing on the cross. Of all the possible names and titles Jesus could have used for His mother, His use of “woman,” in some of His final public words from the cross, “Woman, behold your son,” makes perfect sense. Jesus is acknowledging that Mary, His Mama, is the woman of Genesis, the woman who is and will be the enemy of Satan and the source of the “offspring” who would defeat evil. She is the “Mother of our Savior” in the Litany of Loreto. We can now ask The Woman, who has some real world experience, that “enmity” be put between us and all devils, all demons, and all evil. This request is made, in other words, millions of times daily when the Hail Mary is said: “Holy Mary, Mother of God, pray for us sinners, now and at the hour of our death.” And our Mother will hear our prayer.